Swift offers a number of advantages over Objective-C that make it appealing for iOS development, including dev support and a lack of legacy dependencies. In our last blog, we considered Swift to be one of the most popular mobile app development trends that are going to conquer 2017. And that's quite a fact! 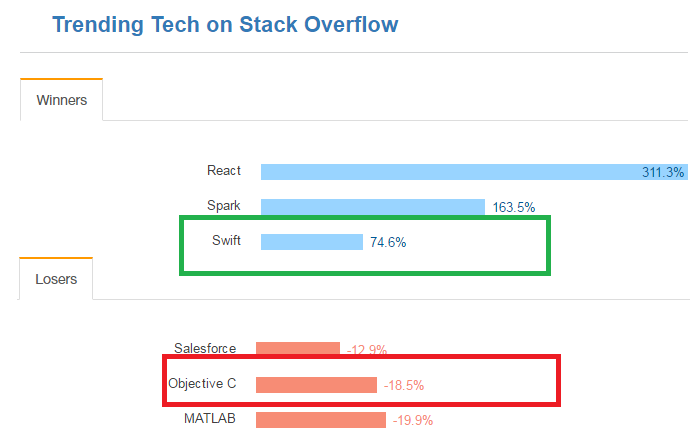 If you are a up-to-date with the iOS world, you know that Swift took over Objective-C slowly and smoothly in December 2016. However, many have missed that the trend is going somewhere else. Our researchers at ValueCoders found that some top notch giants like IBM, LinkedIn, Facebook, Uber, and Mozilla were already involved with Swift. But now, worldwide startups (including the fast-growing ones in Silicon Valley) are focusing on Swift, too. 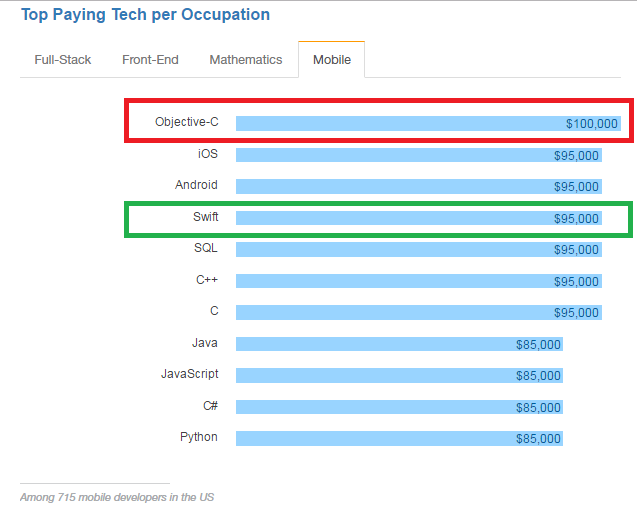 A study from UpWork shows that Swift is one of the top fastest growing skills for startups and freelancers. Before we discuss the reasons, here's some crisp information about Swift's background. Swift has taken off successfully not only because it’s well-structured and designed, but also because people have supported it. Moreover, independently managed conferences such as the Swift Summit help to enrich the community. Let's see what's there for startups to adopt this language. An open-source programming language makes it immediately accessible as well as less costly for startup companies. According to studies, open source software/languages collectively help business owners save around $60 billion per year. One of the biggest challenges for startups is shortening time to market. They need quality products in less time. Swift can help you with that. With Swift package managers, developers can push their packages to collaborate with others, focus on the logic, and utilize different packages to quickly assemble apps in order to reduce time to market. There are also different repositories of Swift package managers, like IBM Swift Package Catalog, which offer high-quality dependency management and easy coding options. Swift, as a functional programming language, supports passing functions as variables. As a result, you produce highly generic code that can do a lot of amazing things, reducing repetition as well as effort. On the other hand, on behalf of Swift's predictable behavior, when a null optional variable is used, Swift instantaneously triggers a run-time crash. The crash fuels up the bug-fixing process due to its consistent behavior. Swift forces you to fix the issue right away. This in return, reduces development time. Safety is a crucial aspect when it comes to mobile applications. In this competitive marketplace, a startup should concentrate on developing a secure app. Moreover, if the app is easy to maintain, then it's a boon indeed. Swift offers both benefits at a time. Be it the way it handles bugs or calls the pointer variables, it produces safer apps than Objective-C. On the other hand, Swift is much easier to maintain, as it does not have any legacy code to deal with. Objective-C can not evolve until C evolves, but Swift does not have such dependencies, which makes it easier to maintain. 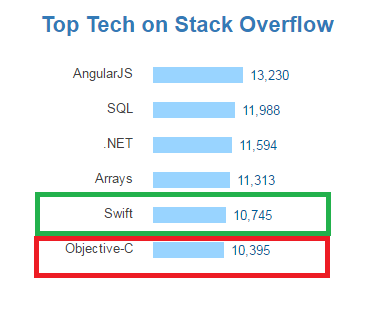 Hence, in order to reduce development costs, Swift is much preferable over Objective-C. Swift is a very organized and well-designed programming language from Apple. It is faster than Objective-C, offers unified memory management, and it is intuitive, clean, and expressive, which allows you to express the intent of the code without the language getting in the way. One of the most important factors for any programming language is the developers. Developers focus on and embrace modern technologies in order to make the development environment fun and engaging while also making sure their talents don't fade. 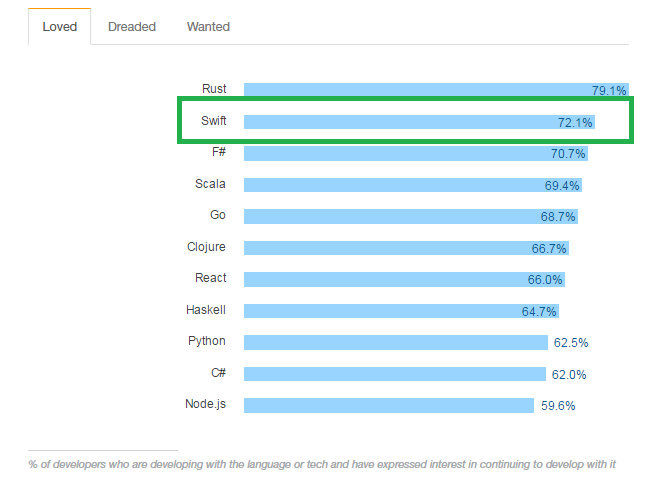 According to a 2016 study in Stack Overflow, Swift is one of the most-loved languages, receiving votes from 72.1 % of developers. Also, Swift has a large developer community, which makes it more supportive and interesting for startup development. In the competitive business environment where time is a deciding factor for startups, it is a major decision to take whether they want to switch to a new programming language. However, if you/ your iOS developers are already using Objective-C, then you have a head-start and don't need to learn an entirely different language.